I was wondering about what to write about next when the best e-mail of the week showed up in my inbox. It was from Puzzle Peace Farm describing all the wonderful produce and goodies they will have at the farmers market tomorrow. There’s good news and there’s good news. First, the pressure of cold overnight temperatures in the next week prompted us to clear out frost sensitive crops. The late freeze has made this the longest growing season we’ve seen for warm weather crops, overlapping with cool crops rather than greeting them and promptly falling over dead. Second, the dropping temperatures make refrigeration a non issue on the farm. (AMEN!) We’re sitting in the 40s right now, perfect for washed and packed greens. What I’m saying is, this is the largest harvest we’ve seen since July, and on half the acreage! Be prepared for a much larger booth tomorrow. Look out for (new crops in caps): ARUGULA, Swiss Chard, Beets and Beet Greens, WATERMELON RADISHES, Easter Egg Radishes, Hakurei Turnips, Kale, Collards, Basil, Okra, Cayennes, MUSTARD GREENS, Anaheim, Green and Sweet Red Bell Peppers, Eggplants, Deer Tongue and Flashy Trout LETTUCE, Nancy Hall, Lee Purple, Tennesee Red, and White Delight Sweet Potatoes, Green Tomatoes, Carrots, Free Range, Grass Eatin’ Happy Hen EGGS, Pet-Food Rosemary Garlic Goat Cheese. Sausage, Ground Pork, and Fatback as well. 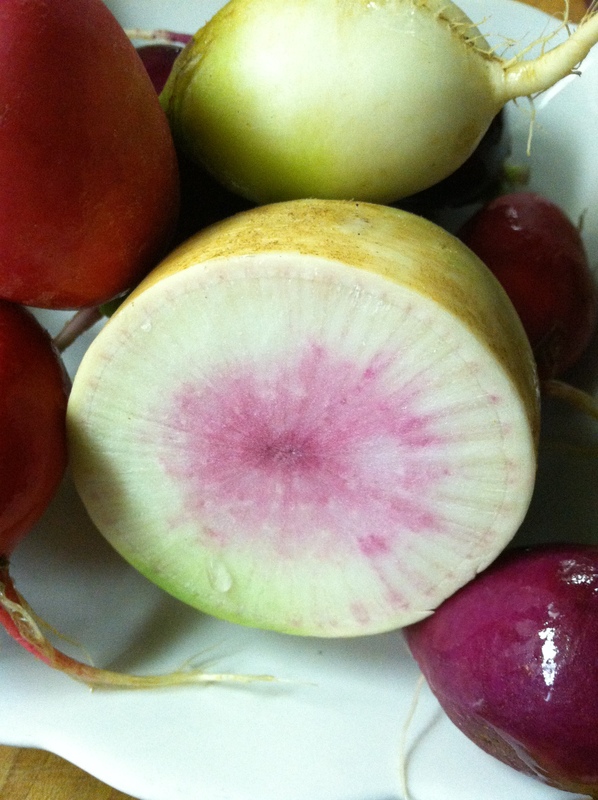 Watermelon radishes are up to size and a must try for the radish lovers in the audience. They are larger, hardier, and slice open to reveal striped deep fuschia flesh, spicy and sweet. Bonus are the tops which are hefty and nutritious. Beet greens are coming in as well. These are a close cousin to Swiss Chard and an added bonus to the beets themselves. They are dense and flavorful, best stewed with butter and salt. 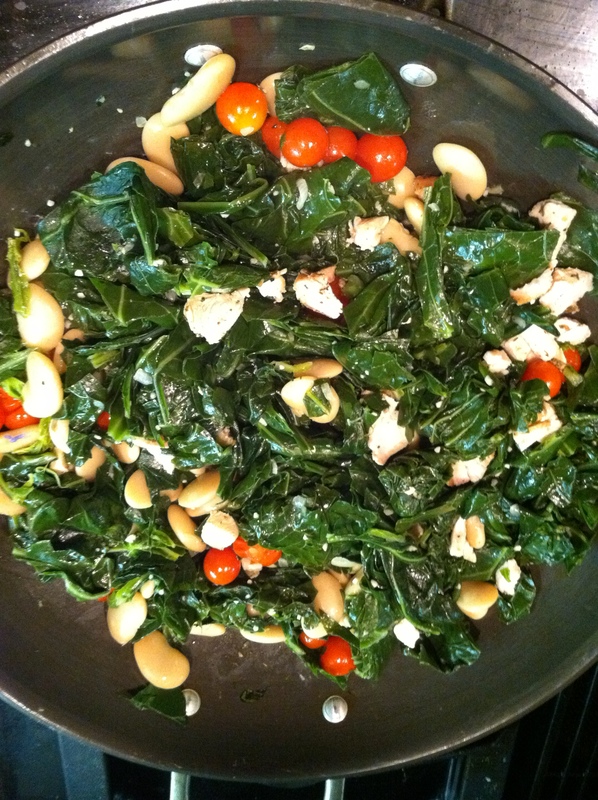 One trick we’ve learned with greens (kale, turnip greens, mustard greens, beet greens, or collards) is to chop and par-boil or blanch them while they’re fresh and cook with them throughout the week. They’ll take up much less space in the fridge and be ready to throw into quesadillas, soups, stir fries, pastas, etc. when you’re pressed for time. Thank you sincerely for your support in our farming endeavor. It is important to all of us to provide sustenance for ourselves and others. It is a heartwarming way to make a living. I must go get some of their watermelon radishes, greens and goat cheese for my pet. Their blog is charming and has great pictures of farm life. Reading about their trials and celebrations brings farm life alive and deepens your knowledge of what goes into the production of our food. It makes you appreciate the food on your table. Thomas is a delight to talk to; he is glad to share favorite ways of cooking the beautiful vegetables and meat he sells. I’ll have to reserve some pork chops for next time. He was sold out when I got there. But I did manage to fill an arm load with kohlrabi (purple!) Easter egg radishes, deer tongue lettuce, some nice spicy arugula, garnet sweet potatoes, a couple of small eggplants, and 1/2 of a watermelon radish. He had sold out of those too except this partial one hiding. I asked about Araucana eggs and Thomas told me they have half Araucana hens and I believe he said that the others were Reds. In the dozen egg holder were green, rose and brown eggs. Araucana hens lay colored eggs, no joke. 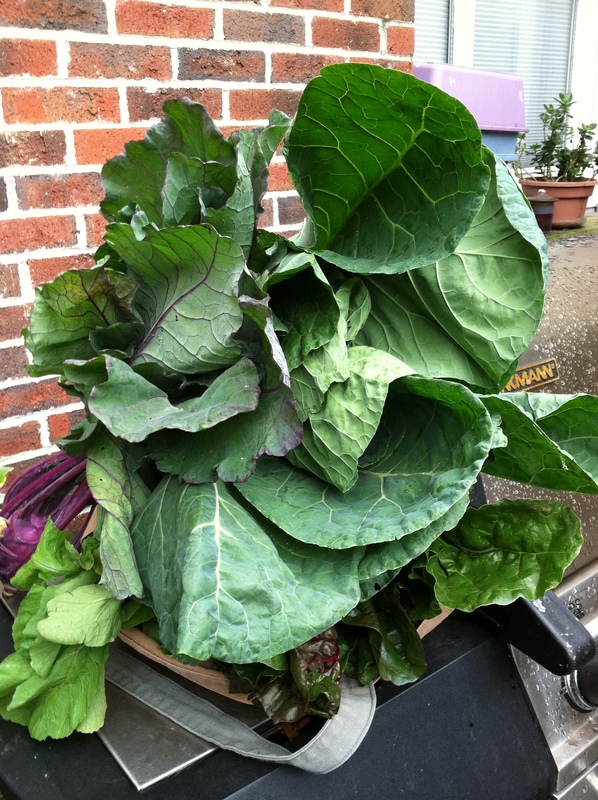 Just down the way from Puzzle Peace Farm were the largest collard greens I had ever seen. So fresh, just picked a couple of hours ago and at only $2.00 a head, how could I resist? For dinner, I blanched then sauteed the collards, added some tomatoes I had just picked, some diced chicken and a can of butter beans; stuffed this mixture into a crispy corn taco shell, added sliced jalapeno, diced red onions and some shredded hoop cheese. 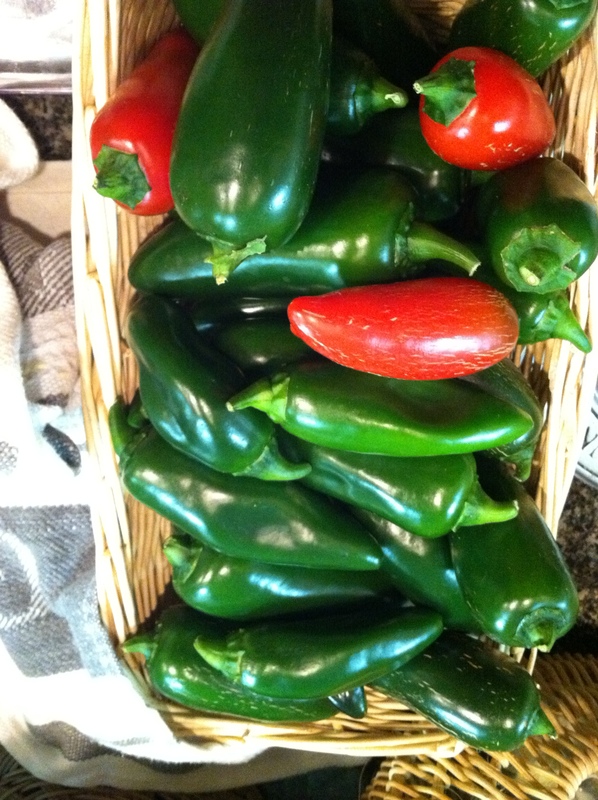 It is supposed to freeze tonight so all that remained on the tomato and jalapeno plants got harvested today. 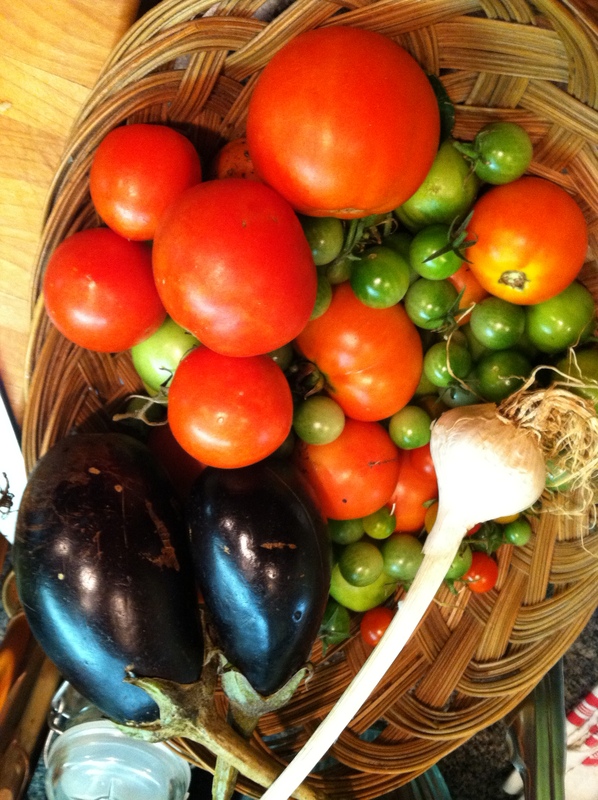 Combined with the bounty from the farmers market, the pantry is well stocked with fresh produce for a few days. When you visit the Yorkmont Farmers Market in Charlotte, NC, be sure to stop by and see what goodies Puzzle Peace Farms has on hand. Say hello to Thomas and Lindy and treat yourself. Check out their blog by clicking here! Support your local farmers. Eat what is grown around you; become a “local-vour”. Meet and talk to those who produce your food. Nourish yourself. You and your family deserve it. I love the idea that some young people are choosing the farming life and ensuring the values of local, sustainable and organic are being continued. God bless ’em!